This berry like fruit found native to West Africa , holds a unique characteristic in that when eaten, causes sour foods (such as lemons and limes) subsequently consumed to taste sweet . and here we thought Willy Wonka was genius but it turns out mother nature has the upper hand . this is due to the marvelous molecule , miraculin , which binds to the tongues taste buds causing sour foods to taste sweet . this miracle fruit does not just stop there , it is said to counter act the metallic taste cancer patients endure after chemotherapy . People often enjoy this delicacy through flavour tipping parties , whereby after eating the berry feast on acidic foods such as raw mango’s, radish, pickles and lemons . One often forgets that it only affects the taste buds as so eating goats cheese would taste like cheesecake on the tongue but taste like goats cheese in the throat . Go and try tantalizing your taste buds and changing your perception of food and food combinations , you may be pleasantly surprised . Had a hard day at work come home to an ice cold beer – mmmm the good life . Or a lovely robust Cabernet swirling around in your glass . Ever wondered how other cultures look at Liquor and its processing !?!? What , how , when and who ? Well in Cambodia they have one drink that is definitively creepy and crawly . It is an alcoholic beverage made from rice liquor and flavored with dead Tarantulas served in a tot glass , how very quaint . Oh no wait that is no the strangest !!! I would take Spiders over Dead fermented mice any day . 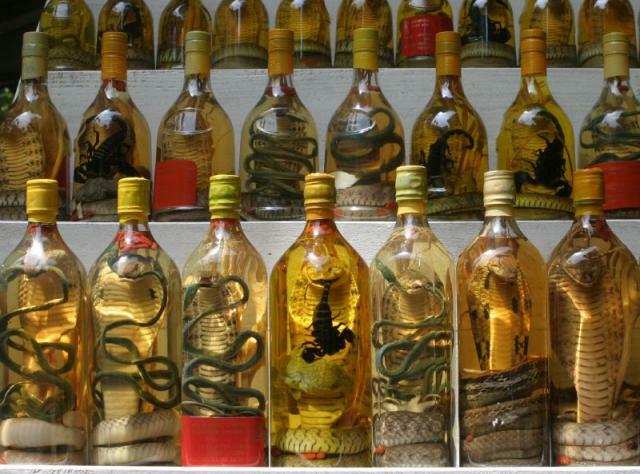 In China a distilled rice spirit is filled with dead mice and fermented for one year . and do they remove the mice !?!? nope they stay in the bottle for added flavour . In complete contrast on the other end of the world we flavour our wine with oranges and spices. I think I shall stick to the vegetarian variety’s in my liquor cabinet such as wine from grapes – fruit , Frangelico from hazelnuts – nuts = Fibre and Protein , and beer made from Wheat hops and water = Carbohydrates and hydration , Complete diet !!! I hope I have given you something to ponder and peruse over . A lot of recipe titles can be deceiving such as Bombay Duck . What would you guess would be the primary protein in this exotic Indian Dish you may ask ? The primary protein in this dish is actually a lizardfish found primarily in the Arabian sea , It looks positively prehistoric !!! nonetheless , this ‘fish’ is usually dried and salted before being consumed , as its powerful odor can be an assault on the senses . By the looks of it it could soon evolve to walk straight off my plate …..but Hey dinner and a show right !!! I think this fish may be more foe that friend . Kopi Luwak are the coffee beans found in Civet feces , This cat like animal only selects the ripest and finest fruit to eat , the beans are actually a by product of what they are really after , the fruity pulp surrounding the beans .When they are excreted these partially digested and fermented beans are the harvested for sale , selling between $160 -$600 per POUND!!! You are probably wondering who discovered this !?!? in the 18th Century the Dutch East India Company established coffee plantations along their routes , the dutch prohibited the local farmers from picking the succulent and tasty coffee fruits for their own use , but everyone has to have their cuppa Jo . The locals learnt that the native Civet like animal digested these fruits and left the seeds (beans ) undigested in their feces , they began to ground these beans and produce their own coffee . The word spread far and wide soon everyone including the Dutch were fans of Civet poop coffee , but understandably the rarity of the resource made it expensive even in those times . So the next time your sipping your coffee , take a minute to think where its come from .